It is sunny in here, full of flower. Beautiful season, but I used to be getting super damage on my skin at Spring, it is due to Spring fever. In this 2018, I have decided to keep moisturising my skin PRETTY well. Recently I rarely earn Acnes, so it is welcomed that being oily afterward of using some moisturisers. At least so far, it is working. It is early April, I know some of you, the audiences are living with seeing snow on the ground. For you, it can be May to June to see full of flowers around you. You may get such Spring fever in May to June. If you are, it is not late to prepare. If you are keeping good condition, you should not change your way. I tell you what I had used. My method is simple. USE MOISTURISERS A LOT day and night. That’s all. I kept using moisturisers really really a lot since it was early of Winter. Sadly my skin is not tough, I can not adventurous for new skin care products. As you can guess, there are TONS of opened bottles what are good but not done with, and in this SS2018, these brands changed formulas for many products, I needed to use some samples or small bottles, trusted brands only, and I used new products when my skin condition is better. I often be more sensitive when my period, prepare for such irritated days, I used the most mild products like Fancl FDR. After of the Fancl FDR, I decided to use ALL of what I am carrying. 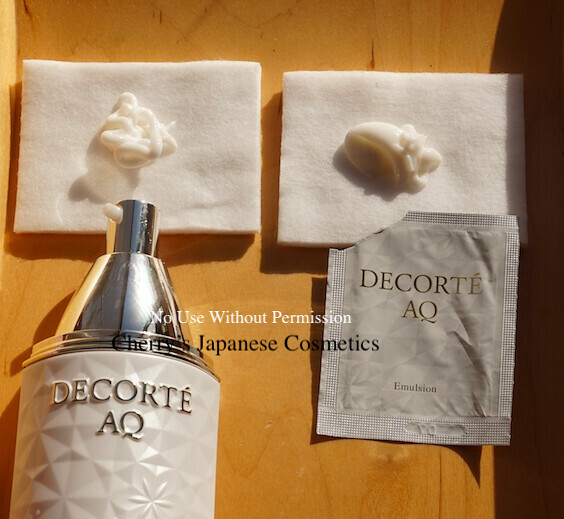 First was Cosme Decorte AQ Emulsion, Lotion and Oil. I used the Emulsion a lot, and lotion was less than the emulsion. I bought AQ Emulsion ER, but there are samples / small bottle of AQ Emulsion and AQ Emulsion White. DONE AT ALL! The second target was Albion Excia AL Renewing Extra Rich Milk SV. (Before of last Winter, I was already done with Infinesse Derma Pump Milk). There was left 7/10. Usually I am done with the quantity in 3-5 months, but done in one month. USED A LOT. The third target was Albion Exage Activation Milk #3. I am not a big fan of Exage line, due to the perfume. It was kept only for the comparison. As Albion BC said the expired limit is 2 years for the Albion milks. I guess it is the very the time to use ALL. It was 110g, small one, but left 8/10. I was done with it 10 days. The Fourth target was Albion Infinesse Whitening Pump milk. This is new for SS2018. I had asked people when they go to pick up albion products, to get Infinesse White samples to review and comparison. There were both Rich Milk and Extra Rich Milk. Extra Rich Milk was left 3/10, and Rich Milk was 9/10. DONE AT ALL. The 6th target was THREE. The line of “THREE” is new for SS2018. This is a sensitive line, and am almost done with the bottles. The line of “Aiming” was strong for me, it was already went to one of the ladies working for me. The current target is small bottles and samples. Still there are a lot of small opened bottles. So far, this method of “use a lot” is working pretty well for me. This is one of the methods, i guess. it you are using less and bad condition, please use a lot. When you are thinking you are using a lot, buy not good condition, please use less. My way is not always good for all of you. Please find your own way to prepare Spring Fever!